While waking up we already knew this would be a glorious day. Blue skies with no clouds in sight. The moment I got out of the house I knew I was not going to need my coat either. Getting to Hamsey Green, the start of section 5 was a bit more of a chore than normally. It involved two tube trains to Victoria, a train to West Croydon and then another bus ride down the road to Ken's Auto at Hamsey Green. After a short section next to a road, we entered Riddlesdown. With mostly open fields and a bit of woodland we made it down into the next valley, coming past a disused quarry. We only really noticed the quarry once we made it over a bridge across some railroad tracks and up a fairly steep path up the hill on the other side of the valley. After some steps, and some more steep uphill part we came to Kenley Common, a now open space that used to be farmland, as a swap for the Kenley Aerodrome that the RAF seconded during the second World War. 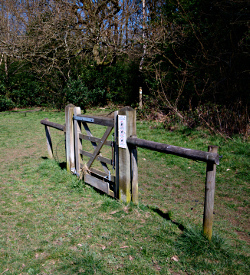 We made a few wrong turns on Kenley Common and there were a few slightly useless fences. Passing through some woods and a field with gliders overhead, we "suddenly" found ourselves at the Wattenden Arms, a pub displaying much WWII memorabilia from the Kenley Aerodrome. The friendly staff served a decent pint, and after refreshing ourselves we continued the walk. After climbing our first style we were overtaken by another LOOP walker as we passed by the Kenley Observatory and a friendly horse. For a bit we had to walk past a road without footpath or pavement. After that we passed by a field with a sole postbox and then made our way to Happy Valley. With the Sun blazing and everything looking greener that it probably was we descended into the valley and back out on the other end. The signing of the LOOP was a bit confusing so I don't think we followed the route correctly, but we picked up the walk again just shy of the next common, Farthing Downs. 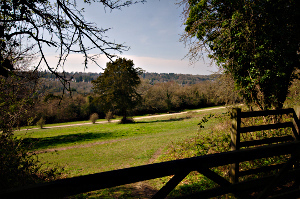 This part of the walk was over a hill crest with the skyline of London in the far background. The section ended with a slight downhill into Coulsdon were we stopped for some refreshments—most importantly cake—at the Poppy Cafe. Because the weather was so nice, we decided to continue with the following section as well, section 6. Passing through South Coulsdon station we had a long climb up a residential road before we continued on a bridleway. 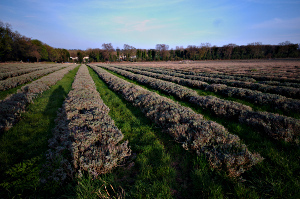 With a long section through some woods and farmland around, a slight detour around a road without pavement, we came upon the Mayfield Lavender Fields. 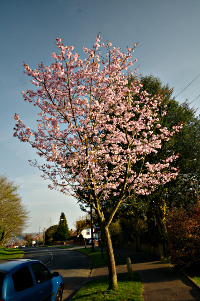 Sadly, we were too early to see it all in bloom, but there was most definitely already a hint of purple to be seen. We then walked through Oak's Park, after which there was another long straight section on the edge of Surrey that took us past HMP Highdown. Luckily most of it was hidden by hedges and trees. The last part of this much shorter section took us to the Banstead Downs and over the Banstead Downs Golf Club to the end of the walk. From there it was a short link to Banstead, where we luckily only had to wait 20 minutes for the train—there is only a service every hour. Where section 5 was mostly known for its up and downs, section 6 was the "horse" section. Lots of bridleways and horses around. The weather was very good, with 16-18°C and no clouds to be seen. We took nearly four and a half hours for the two sections that together were 19.4km long.